As a high school senior in San Diego, Brittany Alba accepted an invitation from the UC Santa Cruz student-outreach program A Step Forward to see the campus firsthand. After setting foot on campus, seeing its stunning landscape and hearing more about the community, Alba decided to enroll. Four years later, the first-generation college student graduated from Oakes College with a degree in neuroscience with a minor in bioinformatics and is poised to help many other Californians follow her path to higher education. "I know a lot of students come from a similar background as me," she said. "If they see someone else from their community made it, it can be something powerful for them." 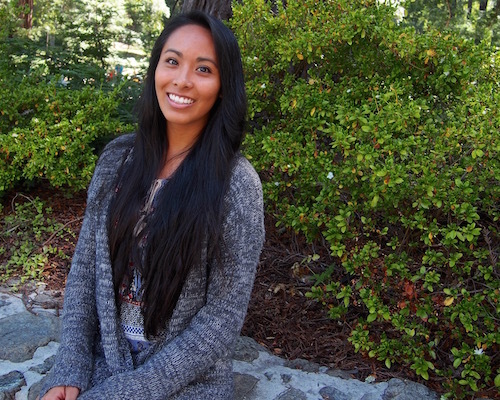 Though Alba was drawn to UC Santa Cruz by the opportunity to pursue science, she's always believed teaching was her calling. Alba will spend the next two years in a fellowship with UC Berkeley's Destination College Advising Corps, encouraging and advising about 1,800 Oak Grove High School students in San Jose. She'll be a source for information about colleges, financial aid, testing and more. Alba will be working with a diverse student body that's comprised of many first-generation college students who may not be thinking of college as an option for them. When she arrived on campus, she immediately got involved with the Filipino Student Association and Engaging Education (e2), a student-initiated outreach and retention center for student engagement and academic excellence. She started as a coordinator for the Kuya-Ate Mentorship Program (KAMP), a big brother/sister program that creates and strengthens the bond formed within smaller communities or "families." Her involvement continue to grow and by 2013, she was serving as a co-chair for Engaging Education. "What's really special about Engaging Education is that they really let students grow and flourish," she said. While at UC Santa Cruz, Alba was able to take time to evaluate some of her beliefs and change her way of thinking. During her second year, she was challenged by a mentor to explore why she had anxiety and low self-esteem. Alba decided to go two quarters without thinking about her appearance. She left her makeup on the counter and kept her hair in a ponytail. "I was forced to focus on what I was good at and to focus on what made me me," she said. "It was a big turning point." This is just a minor example of the ways student organizing began changing Alba's perspective and self-views. Sayo Fujioka, director of Student Organization Advising and Resources (SOAR), said Alba challenged herself to learn complex skills such as facilitation, project management, and leading workshops. "She built truly collaborative working relations with staff and other student leaders," Fujioka said. "Through her work with e2 and the SOMeCA office, Brittany mentored hundreds of new student leaders."